For decades, the Howard Theater was a place where performers of color could get a foothold in the profession, where the community could listen to the sounds and power of the black musician. Sadly neglected since the early 1980s, today the theater is enjoying a rebirth and a entering a new era in its long and prestigious history. As part of its rebirth, contracting firm Peltrix (New York) installed two Yamaha PM5D-RH digital consoles, one at front of house and one at the monitor position. The theater, which seats 600 and houses 1,000 for standing-room only events, hosts high-caliber music performances as well as corporate and political events, given its proximity to the Capitol and its adjacent location to Howard University. Peltrix owner, Amit Peleg, was brought in to replace another designer in August 2009. The building design plans were at 30 percent completion at the time but it was early enough to allow Peltrix to do what was needed in the design stage. 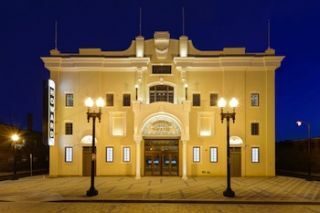 It took two and a half years from the point Peltrix was brought in to completion of the theater’s overhaul. In addition to the design, the company was responsible for the integration and installation of the AV system along with assisting the new owners to hire and train production staff. “We were recommended by the Bensusan Group who are the operators of the Howard Theater, since we’d worked for them at other venues in the past, such as the Blue Note and BB King’s in New York," said Peleg. "Since we are very familiar with their type of business and style of operation, it made communication with the Howard Theater Restoration developers easier." Peleg said the building was completely gutted, and the outer walls were supported externally while a basement was dug and new foundation was put in. This allowed Peltrix to fit a completely modern system into a historical building that originally was never meant for amplified music. “I actually set the requirements which were based on my experience working with the operators on their other venues,” said Peleg.